This March we had the opportunity to participate in 2 events and meet great people from the so dynamic ecosystem of European startups. Specifically, Startup Camp 2017 in Berlin and Webit Festival in Sofia. At the Startup Camp IO Era presented its services and products to a vast amount of founders, developers, investors and people working in the startup sector. 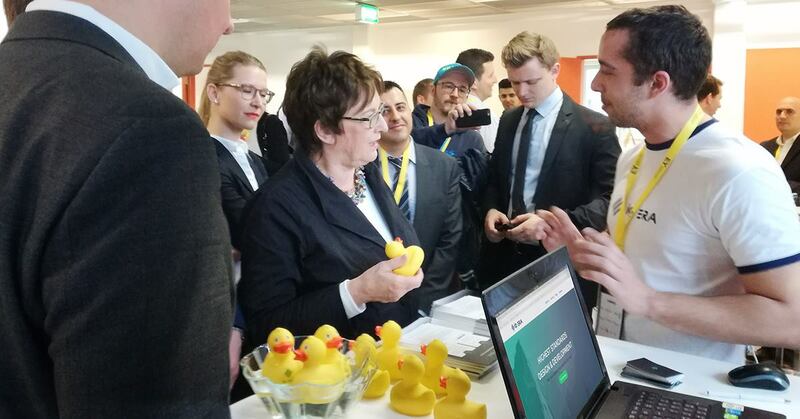 Jordan was accompanied by more than 200 Duckies – our company mascots – and even had the pleasure to introduce the German Federal Minister for Economic Affairs and Energy Brigitte Zypries to the method of rubber duck debugging. A couple of weeks later, in a bit wider composition we participated in something even more exciting - the Webit Festival. It was held in Sofia and gathered more than 5000+ participants from 80+ countries – an experience that is truly inspiring and motivational. Even the President of Bulgaria came to recognize the truly digital world of European startups. Spring helps startups to realize the importance of embracing and adapting to change over time. We definitely took this spring season as a chance to refresh, make some valuable transitions and enjoy. Make sure to enjoy it as well.